Rhys Richards (ed) : Easter Island, 1793-1861. The page numbers are from Rhys Richards' excellent work, his comments in standard font with the titles and original documents in bold. Additional entries or illustrations are marked (Ad), inserted between lines, and with an appropriate reference. My supplementary comments are in [italics], inside square brackets. c Man of Master Island. Drawing by Radiguet from Dupetit-Thouars, 1851. From S. Chauvet, 1934, Figure 12. The comments by Captain Charles Bishop in the Ruby of [??? ]1795 includes very brief references to a previous visit by Captain M the Jenny of Bristol in 1792 or 1793. This account is quite well known, but included here, much abbreviated, because the published version is not readily available. Have made great progress towards Easter Island where I mean to put in and try to procure some sweet potatoes, fowls, etc. It has a barren appearance; no wood.... small canoes came off with two men: They approached with much caution, but as they perceived by our presents of hoop iron. that we were friends, jumpt overboard and were taken on board. As we passed along observed a good many natives sitting on the sides of the hills which are covered with plantations of sweet potatoes, sugar cane, yams and other roots. Near many of the villages they have one or two monuments standing on the sea shore facing them; these seem to be intended to represent human figures; but done with a very coarse idea, they stand some twenty feet high; and appear constructed of stone; and are certainly erected either as monuments of some of their worthies, or on some religious idea. Some of them content with the presents they had received, a knife, a piece of hoop iron, or a looking glass, jumpt overboard and swam to the shore with their news. Daylight no sooner appeared than off they [all ] came - men, women, boys and girls, the ship was surrounded with beauties. 1. The next twenty or so words were scored out. Some of them were painted a little with a reddish ochre, over the forehead. Both men and women seemed very fond of a little boy I have under my care about ten years of age.. whom they sought hard to kidnap, but so benignly and gently that I was sure they were not as is said cannibals, but they were prevented from carrying him off. Lisiansky, in the Neva, sailed along the east coast in very rough seas in April, 1804. The islands seemed to the Russians harsh but green, fertile but treeless. They saw standing moai on the south west and north coasts, and noted several forms, some with white tops. It should be noted that in this decade several Boston fur traders probably passed close by Easter Island, or called there, while en route round Cape Horn to the North West Coast and Alaska. Adams was mate on the Boston ship Atahualpa trading for furs at Milbanke Sound in June 1804. After her captain and eight men were killed, Adams took command, resting at Hawai'i from August to October 1805, reaching Canton in November, and Boston early in 1806. Captain Jonathan Winship pioneered the poaching of sea otter skins on the coast of lower California in 1806 in the 280-ton ship O'Cain of New York, of which he was a part owner. He was again captain of the O'Cain on its third voyage, leaving Boston in May 1809 for further fur trading on the northwest coast of America. Owing in part to the disruptions of the War of 1812-1814, the O'Cain's voyage lasted eight years, including several seasons on that coast and further north trading with the Russians in Alaska. object was not only trade but also to establish an American trading station at the mouth of the Colombia River. That it was Nathan Winship, rather than Jonathan, his elder brother, who was at Easter Island during 1809, can now be confirmed from the following long account written by William Alden Gale, on or about January 18, 1810. The island is situated in Lat. 27.09 S. and Long. 109.116 West. Owing to the cunning and thievish disposition of the natives, which is truly astonishing, we did not think it prudent to land, as it might have given rise to a misunderstanding. The captain went in with a boat and six men to Cook's Bay, and the ship lay off. While we were trading with the natives at a short distance from the shore in the boat, they swam off to us with potatoes, sugar cane, bananas etc. for which we exchanged small bits of old iron hoops, fish hooks and nails, the last of which they seemed to set great story by. Beads and small looking glasses etc they would not purchase, although they would steal the most trifling article that they could lay their hands upon. Numbers would swim to us, and after disposing of what they bought, would wait till others came off and then divide what the newcomers brought among them all for the purpose of each one procuring an additional fish hook or piece of hoop. They would bring their potatoes in bunches tightly tied together, and as soon as they obtained what they wanted for them, as if by accident, while handling them to us, let them drop into the water, and immediately diving down, would bring them up for a second sale, and even went so far as to purloin the same things that they had just before sold to us, out of the boat, for the same purpose. They also made several attempts to steal the rudder of the boat, and so far succeeded as to break the irons by which it was hung, when we were obliged to take it on board to prevent their making off with it. Those who swam off to the boat, both men and women, had nothing on except a plat of grass or a small piece of tappa (cloth) round their waists, though the number who remained on shore had long pieces of the latter stuff thrown over their shoulders, which reached nearly to their feet. The women were well formed and handsome featured. These came off more for the purpose of attracting our attention, so as to give the men a better opportunity of exercising their thievish talents, than they did to trade. A few of their words are similar to those of the Sandwich Islands, though the number is very small. 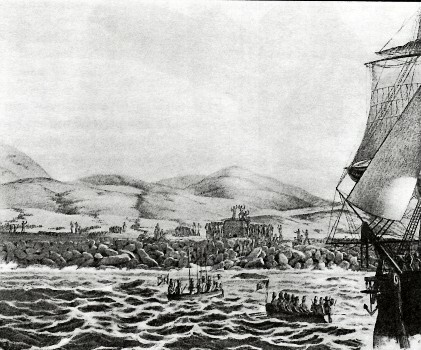 The Russian exploring ship Rurik, Captain Kotzebue, was at Hanga Roa just one day, March 28,1816, but the ship carried scientific observers such as Chamisso and Esehscholtz who wrote perceptive reports, and the talented artist Choris, Baratt has published further annotated translations from the Russian originals and again has added valuable scholarly commentaries. At first two canoes, each with two men came off to meet the visitor hesitantly "with fear and distrust". Many islanders swam out to the ship with bananas, yams, and sugar cane, which they traded shyly for pieces of iron, particularly knives which were soon exchanged for nets, sweet potatoes, yams and fruit, and later bait nets made from paper mulberry fibre. At daylight saw Easter Island ... running along east side. As we approached N, W, Point, which we rounded at a mile distance, saw a number of natives running, hollowing and saw some swimming off to the ship which was going at least 5 knots. Hove to ship with her head offshore, but before this was done, they were alongside and had caught hold of the ropes that had been thrown to them, held on surprisingly. We hauled six of them up, and then led the ropes in board, or we should soon have had too many. As soon as they were on board they begun to caper and dance about, with every appearance of being very much pleased. They got up the rigging and halloowed and called to their friends. They were answered with loud cheers on shore by thousands. Nor did they evidence any fear, but run about like madman, dancing, singing and making all manner ol noise, hardly being engrossed for the moment upon the same thing. The looking glass particularly excited their curiosity. They all of them brought a bag with them, either in their hands or tied around their loins, made of the plantain leaf containing some beautiful sweet potatoes. By their actions they were very anxious for wearing apparel. From what could be seen of the natives ashore, they did not seem to have any offensive weapons whatever. The shore was lined with them, cheering, hallooing and waving to us. Before they left the ship they measured her from stem to stern and from side to side, measuring in fathoms and one of them would count in a high voice, stamping and waving his arms up and down. And they also counted the number of [our] people on deck. When they were going to leave, they took there cloathes and presents, every man his own, in a bundle and tied it round their loins, and then shook hands with all of us, they having, as we supposed, taken notice of our doing so, as a mark of friendship, and so returned the complement and overboard they jumped. Around one of them the captain fastened a bottle with a paper inside expressing the name of the ship and her voyage, the lat. and long, of the island etc. A young British seaman, Thomas W. Smith, was on his eleventh voyage when he shipped from London in October 1821 on the whaleship Spring Grove on a voyage round Cape Horn to Chile, Peru, and the Galapagos Islands. We touched at Easter Island to obtain some refreshment for the crew. Two boats were sent in to trade with the natives while the ship lay off and on. The bartering articles consisted of bent needles and pins, buttons, beads and other trinkets, for which we received in return potatoes and sugar cane. The pins and needles were used by them to catch fish, being superior to native fish hooks which are made of hard wood or stone. Easter Island is about sixty miles in circumference and densely populated; the general appearance of the soil along the sea coast is of a dark red, and the soil appears to be good. They raise sugar cane, yams and potatoes in abundance. These productions of the islands, together with all kinds of shellfish, which they procure plentifully, constitute their subsistence. The natives are of a light colour; tall and handsome. Their chiefs are handsomely tattooed on their faces, necks, lips, tongues and arms. But they are in a most savage state, in consequence of which we did not venture to land, but were under the necessity of laying off in our boats at a distance from the shore while the natives swam to us with their goods. During 1823, the Paragon of Nantucket, Captain Henry Bunker, also touched at Easter Island for supplies. The Paragon was reported at Honolulu in April 1823 (Richards 2000 p.42), and probably visited Easter Island later that year. A boat party that Peard commanded had a narrow escape at the hands of about a thousand Easter Islanders, apparently because they had expected to receive more presents than his naval men had to offer. are like inverted canoes, and some appeared to be at least one hundred yards in length. The land looks dried up and barren, except here and there, where we observed clumps of banana trees and marks of cultivation... The gig and cutter went in ... the natives collecting in great numbers, some hundreds of them threw themselves off the rocks and swim towards the boats.... The females commenced a loud and rather discordant song I suppose by way of welcome.... They came fearlessly alongside and held up bananas, yams, sugar cane, celery" and small baskets of potatoes, but were not disposed to barter them for nails or arrow heads, ... wanting fish hooks. The natives generally are good looking. Some of them had a ragged sort of cloak of a cotton-like substance over the shoul¬ders, but by far the greater number, both male and females, were entirely naked excepting a narrow strip of cloth or twisted celery leaves in lieu of a fig leaf. Many of the males had a few hairs on the chin, and were tattooed and besmeared with yellow ochre and black paint over the face and lips and other parts of the body. The females especially the younger ones had good figures and were far from ill-looking and all of them without exception tattooed in front from the hips down to the knees of a dark bluish colour. They are as much at home in the water as the men. Peard is not the first to identify a plant on Easter Island by the name "celery" even ough it is doubtful that celery (Apium graveolensi) is the plant being identified. Cook, during his third voyage between 1776 and 1779; Forster in 1786; and Thomson in 1891 all described "celery" on the island. However, according to Ziska (1991 p.31), celery is a native the temperate regions of Europe, Africa, and Asia and the use of the term here is either outright error or possibly the result of misidentification of a species of Apium. The French Government dispatched several expeditions during the 1820s and g30s to promote French commerce and French whaling by finding and surveying harbors and anchorages where whalers particularly might shelter and find refreshments. This was the primary objective of the voyage of the frigate La Venus under Captain Du Petit-Thouars. After having rounded this headland travelling westward, we passed what is known as Spanish Bay; from the summit of the eastern point, the land drops in a gentle slope towards the west, in such a way that the bottom of Spanish Bay connects with a valley, in which we noticed cabins and some areas of land which appeared to be well cultivated. While skirting the coasts we saw a large number of natives on the summits of the headlands who, from their gestures and shouts, which we could hear, seemed to be inviting us to land. Others came and went on the beach; some were covered in a white fabric which they wore loose; the majority of the natives were completely naked. Footnote VI. Anakena or possibly Ovahe. For a moment the canoes could no longer keep up with the frigate, which had caught the wind, and they fell behind at some distance. Once our observations were complete they left; all, men and women, threw themselves into the water and swam to their canoes. The men were very able swimmers, the women were equally very accustomed to this exercise but they swam differently to the men; they did not move their arms and legs at the same time as did the men, but moved them alternatively. This was common to all the women. Footnote IX. This fear that the Islanders had when they thought they had been kidnapped was not without cause as several whaling ships, when short-handed, had captured men and women at various islands, and few of them were ever returned home. After this first visit, we were travelling to the west at great speed when we heard cries coming from the open sea; soon we saw two men swimming towards us and giving the cries we could hear from a great distance; each of them appeared to be upon a piece of broken canoe of which only the front could be seen. I sent out a boat to taker them up; I feared that, given the great distance they were from land, that they would become victims of the curiosity which we had created because I believed that their canoe had been broken. But we were greatly surprised to find that these natives were sitting upon a coil of rushes each, in the shape of a sheaf of wheat.They brought us, in order to be assured of a good welcome, bananas, sweet potatoes and yams, carried in the reeds. We had a great deal of difficulty in getting rid of our new visitors; they laughed at our threats and did not want to leave us, however when I gave orders to throw their bundles of reeds into the sea, they threw themselves overboard after them and returned to their island. While skirting the western coast of Easter Island we melt much smaller number of canoes than on the northern coast. This is no doubt because they fear travelling away from the island to the west where the currents always flow. On this coast only 2 canoes would come alongside, two or three others would be in sight but they stayed windward of the frigate. In total, from one side of the island to the other, we would have seen at most a dozen. All the canoes on Easter Island are very small and could only contain two or three people. They are made with very straight and short pieces of board. These boards are sewn together, to make the hull, and caulked with a type of moss. These canoes have a single balancer (outrigger) like those of the Sandwich Island but theirs are inferior and also are less pretty and less graceful, yet they must require much more labour to build. (c) Twenty-Four Known Visits in 1841-1851. The Margaret Rait of St John, New Brunswick, Canada, made her third in the Pacific from 1840 to 1844 under Captain James Coffin. N.E. part of Easter Island ... sent two boats in to barter with the natives for potatoes. They returned at noon with about four barrels. The produce of the islands consists of sweet potatoes, yams, bananas and sugar cane. In exchange for these they take the [crispy, deep fried] scraps which remain from whale blubber when it is dried out, small pieces of wood, and fish bones [perhaps whalebones?]. Take your articles of Trade — scraps etc — in your boat and pull to within a cable length of the shore, which is prety rough, and upon which the surf breaks heavily. The natives with a basket containing about half a peck of potatoes [tied] fast to their backs or round the waist, plunge into the breakers, swim off to the boats, pass their baskets in. We rifle their contents, put in a scrap, hand the basket to its owner, and away he goes to shore. 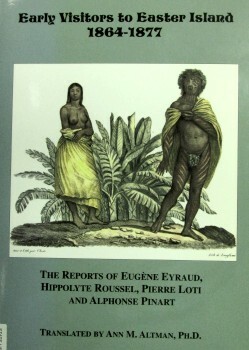 Hugh Cuming's Account of an Anchorage Rapanui (Easter Island), November 27-28, 1827. Between its humble covers lies a veritable treasure-trove of early 19m centary information on an impressive list of Polynesian islands. Pages 7-12 (frames 14-9) of this journal include a detailed account of an anchorage at Hangaroa (Cook Bay), Rapanui, affected November 27-28, 1827. Because such early reports about Rapanui are rare, and, in particular, as this one is exceedingly wealthy in significant observations, it is reproduced here verbatim. Footnote XIII. 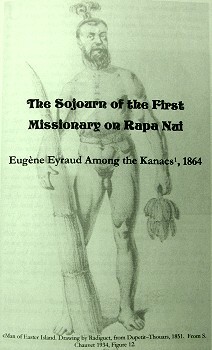 First published in the Journal of the Polynesian Society, 1991, Volume 100?, page 3??-316. swam onboard each person having a small Net or Basket or a Bunch of planiians on his Back for Sale or barter. When the Sea becomes rough which occurd in the afternoon some of them made use of small Balsas or Bundle of Flags about 2 Feet long, Six Inches thick at one End and taper­ing to a point at the other, this the[y] place betwixt their legs to assist them in Swimming at which the[y] are very expert as I ever witness'd, having come onboard the[y] appeard perfetly at home showing the utmost good Nature and freely gave what the[y] had brought for any small trifle that was offerd them they where [were] particularly partial to Wood and Fish hooks for one only the[y] gave a Net or Basket full of Fruit or Vegetables. Money they appear to not have an Idea of when offerd to them they tried to bite it, from every appearance what I saw they neither have any Quad­rupeds or Tame Fowls neither could I find they had any defensive Wea­pons, they brought onboard a few small poles about 6 feet long, headed with a stone but from the softness of the Wood and the insecure manner the sharp stone was secured it could be of small service as a defensive Weapon. I rather should suppose them to be used for Fishing Spears. They had also some about 18 Inches long which I suppose where [were] used as Knives from the brittleness of the stone I am of an opinion they would not be able to cut any hard substa [substance] with them, they also had a number of small Figures carv'd of Wood in the shape of men and Fishes, but whether they where [were] Household Gods or Toys for their amuse­ment I could not discover. after some little party with them I got some of the Idols from the owners, they would not part with them except for some Species of Cloth as Hankerchiefs or Shirts of which the[y] appeard very fond of. previous to the delivery of the Idol the[y] set up a great Shout lift­ing up the figure above their Heads several times all joining in Chorus and when upon delivery they would prop it against their brest several times. Although their Chorus was very boisterous it was not unmusical, it gave me great pleasure to see their extreme good Nature shown on every occas­ion, they appeared perfectly at home as if we had been acquainted for Years. Of these doubtless scores of visits, only a few accounts have survived. The calling at Rapanui on 6 March 1830 of the British forty-six-gun man-of-war H.M.S. Seringapatam under the command of Captain William Waldegrave is exceptional, for two reasons. First, the Seringapatam certainly was the largest vessel that had yet fetched up off Rapanui, an event which would have left an indelible impression on the Rapanui people. Second, there exist three eyewitness accounts of this calling. Guthrie served aboard the Seringapatam for many years as surgeon under Captain Waldegrave. On 6 March he also shared the Seringapatam's first Polynesian calling - Rapanui - and penned the very same day a detailed acount of what he experienced there. 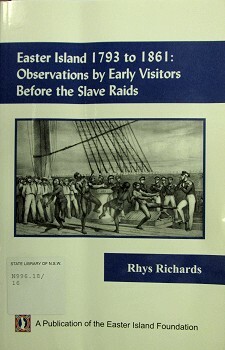 His observations comprise a rare addition to the two other accounts of this historic visit. My special thanks go to Robert Langdon for having informed me in August 1993 at the Rapa Nui Rendezvous at Laramie, Wyoming, on the existance of Surgeon Guthrie's journal. I have maintained Guthrie's original orthography, but have edited the punctuation in some cases to facilitate reading. To relieve the women in swimming they lie on a long bundle of straw which the men push forward. Metraux (1940) Ethnology Easter Island, Bishop Museum Bulletin 160. All were much surprised at the size of the Ship, (45) and a number of them followed each other in first counting the planks of tile upper deck, then measuring the breadth and length of her by lying Down and extending the arms; this they did with great quickness. They next counted the crew; first the Officers, then the men who were on deck; the number excited great surprise. Five Canoes, about ten feet Long and built of small narrow planks, were all that we saw, they were necessarily very leaky. 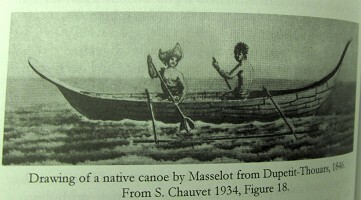 They have an outrigger consisting of three pieces of wood, about 2 inches diameter and 7 feet long; two proceed from each extremity of the Canoe on the Same side and the third is made fast to the outer end of these. The paddles are About 4 feet long, the handle occupying 3 feet, the 4th is the loom, made in the Shape of a Long Cross thus. Solid. Early visitors to Easter Island 1864-1877. Pierre Loti, and Alphonse Pinart. Bearsville Press, Los Osos, California, c2004. Easter Island Foundation, Los Osos, California, 2008. Geoff Cater (2014) : Rhys Richards (ed) : Easter Island, 1793-1861.